On a recent Friday afternoon, students and faculty in Samford University’s Department of Communication Sciences and Disorders were invited to a department social in the College of Health Sciences Lobby hosted by Alan Jung, School of Health Professions dean. Only one person was unaware of the real reason behind the event and that was Margaret Johnson, professor and chair of the Department of Communication Sciences and Disorders. For almost eight months, Johnson’s colleagues, students and friends had kept the secret that the school was raising money for a scholarship in her name. More than 60 people gathered in the College of Health Sciences lobby where Jung had the honor of making the announcement. “Through the generous donations of almost 100 donors, the School of Health Professions raised nearly $30,000 to establish the Dr. Margaret L. Johnson Scholarship,” he announced. Upon hearing this news, Johnson looked at Jung in disbelief. “I normally don’t find myself speechless,” she said. After Johnson had a moment to collect her thoughts, she shared her gratitude for everyone who not only gathered for the celebration but who also made a contribution in her honor. “I know we offer amazing programs here at Samford, but there is a cost that goes with that. With this scholarship, we will be able to provide a helping hand, and for that, I thank you from the bottom of my heart,” she said. Johnson has spent more than 30 years practicing as a speech language pathologist and almost 25 of those in training students in the field of communication sciences and disorders. The Dr. Margaret L. Johnson Scholarship not only honors Johnson’s legacy of service but also provides financial assistance to the students she serves, Jung said. 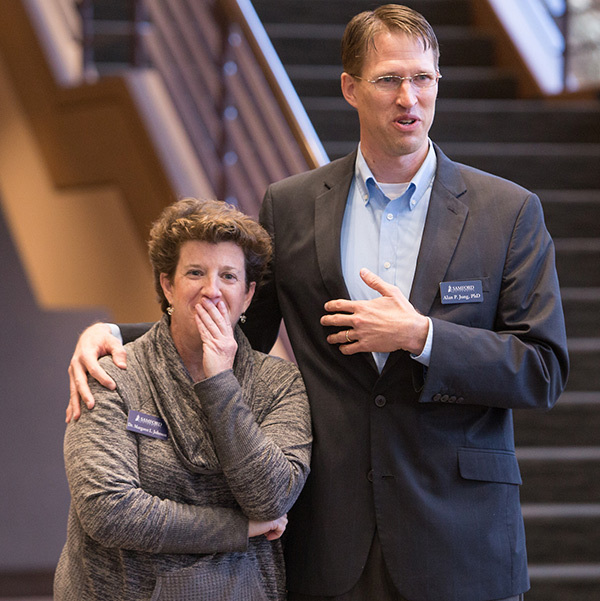 The fundraising efforts for this scholarship were immensely personal with the majority of donors being close friends of Johnson, including members of her church, former colleagues, professors and classmates. Sue Hale is Johnson’s former professor. Contributions can be made to the Dr. Margaret L. Johnson Scholarship online. Your gifts will help the School of Health Professions reach its endowment goal.